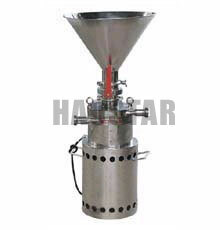 Hao Star material fluid mixing pump is also called water and powder mixer, water and powder mixing machine, fluid material mixing machine, fluid material mixing pump, mixing machine, etc., THJ-L vertical material fluid mixing pump, THJ-F separated type. With unique appearance, light and portable cubage, environmental protection, neatness, energy saving, high efficiency, rapid mixing, convenient to transport as well as other advantages, it is a new-era mixing machine of water and powder successfully developed and made by our factory. Main working principle of this equipment is making use of high-speed rotating impeller to sufficiently mix powder material and liquid and produce required mixture. The max temperature absorbed by this equipment is 80℃, and it can be used in the production of juice or other beverages. It can mix fluid material at high speed to receive ideal benefit. 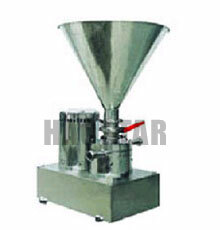 So it is one of necessary equipments in foodstuff as well as beverage industries. Besides, it is especially suitable for production of remanufacturing dairy, for example: suitable for milk powder, whey powder, calcium milk, dextrin powder and others to mix with fluid, in order to further meet the needs of excellent and environmental protective production and processing requirements in foodstuff industry, daily chemical industry, medicine industry as well as other callings, we can carry out special customization according to PH valve, viscidity and other conditions of processed materials. Foodstuff industry: prescribed milk powder, whey powder, dextrin powder, yoghourt, fruit milk tea, ice cream, stuffing of moon cake, butter, jam, juice, soybean, bean jam, sweetened bean paste, peanut milk, albumen milk, melted milk, essence, various remanufacturing beverages, etc. Medical industry: various syrups, nutrition liquid, Chinese Traditional Patent Medicine, poultice, biological product, pollen, bee loyal jelly, bacterin, various ointments, various oral liquids, etc. Other industries: oil painting, pigment, dyestuff, dope, various dopes. Including dope for inner and outer walls, anti-corrosion waterproof dope, cold porcelain dope, multi-color dope, ceramic glaze, etc.